Erin McIntosh is an artist and educator living in Athens, Georgia. She is an assistant professor of Studio Art at the University of North Georgia on the Gainesville campus. Erin has been teaching in higher education since 2007. Prior to that, she taught art to elementary-aged children in the public school system, through Atlanta’s public art programs, and at the Georgia Museum of Art. She has taught multiple semesters in Cortona, Italy, on the University of Georgia’s Cortona, Italy, study abroad program. Erin’s studio practice is rooted in abstraction in water-based media. She actively exhibits her paintings in solo and group exhibitions regionally and nationally. Her paintings have been published in New American Paintings, The Georgia Review, and Create Magazine. She has had residencies at the Vermont Studio Center and Atlantic Center for the Arts. Erin’s work is represented by Gregg Irby Gallery in Atlanta and Weinberger Fine Art in Kansas City, MO. I find so much joy in moving paint around. I love to explore color and composition through painting a range of subjects that are biomorphic or geometric in nature. Many of my recent paintings are inspired by biological sciences and the microscopic world. The paintings I make are process-driven, poetic, playful and constructed through improvisation. My interest in abstraction is not only in its visual form but also in how visual form communicates sensorial meaning, non-verbally, akin to that of instrumental music. By making a painting, I want to add something to the world that uplifts. It is often said that when you truly love what you do, you’ll never work a day in your life and for Gregg Irby, this has proved to be true. Creating Gregg Irby Gallery has become the fulfillment of her lifelong dream. Growing up in South Carolina, Gregg was enchanted by the art her mother created and as she grew, art was never far from her mind. 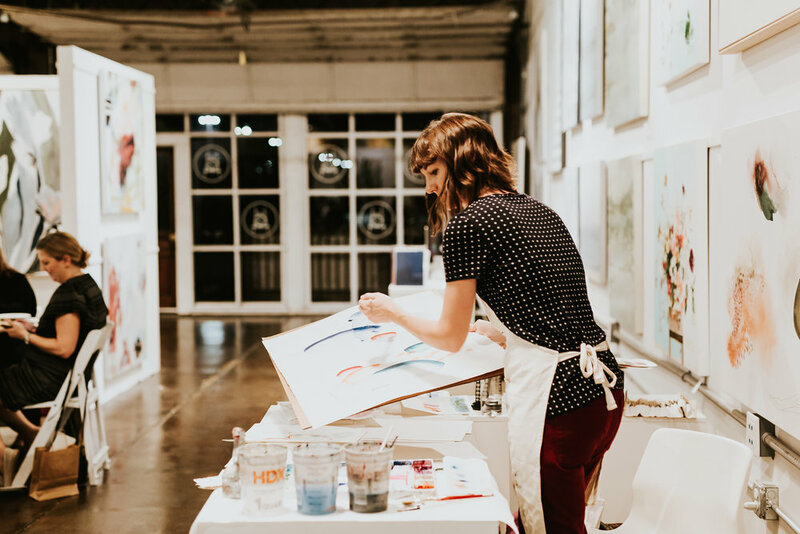 After earning a BS degree from the University of South Carolina and an MBA from Georgia State University, she began to collect paintings by emerging artists. As she continued to collect, she began to appreciate these artists’ talents and to recognize their untapped potential. She saw the true need for a gallery that could help to discover and present new artists, foster and cultivate their talent, and provide them with an unpretentious and accessible place to show their work. In 1996, she began working with a handful of artists and offering their work at private shows across the Southeast. After a string of successful shows in Atlanta, Charlotte, Charleston, Nashville, and Jacksonville, Gregg knew she was onto something. Collectors responded to her low-key approach to presenting art in relaxed, gracious settings – and to her talented eye. Her original gallery opened in 2007 in a small cottage behind a church in the Buckhead neighborhood of Atlanta. Visitors to her gallery immediately noticed and appreciated these talented rising stars of the art world. As a result, many of these artists’ careers matured and flourished alongside the gallery’s and raised all to nationwide acclaim. In January 2015, the gallery moved to its current 3,400 square foot space in Atlanta’s Westside creative district. This decision allowed the gallery to continue to represent its once emerging and now nationally recognized artists, while being able to add other up & coming and acclaimed artists to its team. Rather than having individual shows featuring one artist’s work at a given time, we try to have every member of the gallery represented on the floor at all times. This exposure is key for our artists and also provides our collectors with a holistic view, demonstrating how an abstract and a landscape from the hands of two different artists can relate & live together. We truly love all of the work that we represent, and the gallery has become a curated collection of artistic styles that complement each other. This results in a loyal client base that returns time and time again to build a collection of their own, mixing and combining different styles. I have so much respect for the women I’ve mentioned in this post, and it truly blows me away to reflect on my own beginnings as a self-taught photographer, picking up the camera for my old mommy blog. I had admired these artists from afar, never daring to think I would one day photograph them, and that they would appreciate my work much as I do theirs. Their stories and their work give me hope - that despite what recent events have exposed about our culture’s attitude toward women and their individual sufferings, the crushing injustices that so many have faced and some courageously choose to speak publicly about for the sake of defending truth, despite the challenges women face just by existing - these women are bringing beauty that is breathtaking and light-bearing, and it speaks to the viewer of our shared humanity and the gift of life. Their work gives me a larger, greater perspective than the narrow place I sometimes find myself in. Just as Erin wrote at the end of her artist statement - “By making a painting, I want to add something to the world that uplifts” - to that I say yes, amen, and thank you.